Nearly 1,000 people died last year in Missouri from a drug overdose, but the demographics are skewing younger. Now, the federal government is pouring nearly $4 billion into combat efforts at the state level. KANSAS CITY, Mo. — Nearly 1,000 people died last year in Missouri from a drug overdose, but the demographics are shifting. "It is a younger crowd that is getting into it, guys fresh out of college," said Micah Haen, the operations director for Welcome House, a residential sober-living and recovery nonprofit in Kansas City, Missouri. Nationally, the Centers for Disease Control and Prevention said more people died from drug overdoses than car crashes and gun violence combined last year. It's a problems that's hitting home in the Kansas City area as well. 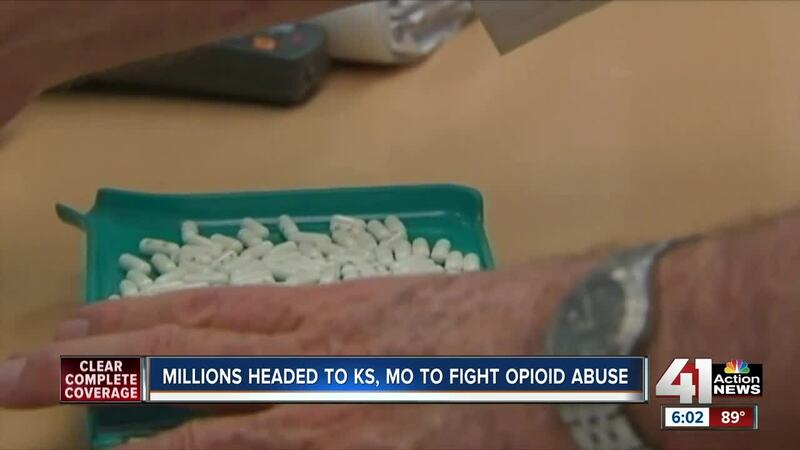 A study by First Call and the University of Kansas School of Social Welfare found an increase in drug-overdose deaths in Jackson County, Missouri, and Johnson County, Kansas, with a higher percentage of young people abusing drugs. Haen said his organization has seen an increased need among Johnson County youth. "It seems like it is starting earlier and earlier and it does progress quickly," Haen said. "We have had guys come in and been on opioids a year and they have lost everything." It's a sad, but increasingly common story. Jo Marie Barnaik, a recovering opioid addict, spoke with 41 Action news about her struggle last summer. She got off probation in April, but that was only after having two of her children taken away as she battled through addiction. "Don't be afraid of the consequences," said Barnaik, who has been sober for more than a year. "If you continue to do what you are doing, you will die or the consequences will be worse. I wish I would have asked for help way before I lost my kids." The federal government is pouring money into states to combat the problem, including $31.5 million this year in federal grants from the U.S. Department of Health and Human Services, which was announced Wednesday by the office of Sen. Roy Blunt (R-Missouri). Overall, the bill provides $3.8 billion for opioid programs for fiscal year 2019, though today's announcement comes out of a bill passed for the 2018 fiscal year. "The number one cause of accidental death in America today is drug overdose," Blunt said during debate about the legislation. "This bill provides $3.6 billion towards targeted opioid funding." Among the grant recipients, the Kansas City Care Clinic and Swope Health Services will both receive more than $280,000, but securing money is only one part of the challenge. "We see the numbers rising, but we are not seeing those people ask for help," Haen said. "It seems like people are not aware that there is help out there for that." HHS Deputy Secretary Eric Hargan, HHS Assistant Secretary for Mental Health and Substance Abuse Dr. Elinoire McCance-Katz, and U.S. Surgeon General Jerome Adams will make two appearances Thursday in St. Louis as part of the recently announced Prescription Opioid and Heroin Epidemic Awareness Week from Sept. 16-22.